It is believed that the Jindo resulted from crosses between indigenous Korean dogs and dogs brought by the Mongols during their 13th century invasion of Korea. The Korean King surrendered, but some of his armies withdrew to Jindo Island, off the southern coast of Korea, where they continued to fight. The soldiers’ dogs ended up isolated on Jindo Island, where they developed a very pure strain. Jindos served both as hunting and guard dogs in Korea. In 1938, the Korean government designated the Jindo as a National Treasure. Jindos marched in the opening ceremonies of the 1988 Olympic Games in Seoul, Korea. The United Kennel Club recognized the Jindo on January 1, 1998. The Jindo is a medium-sized, sturdily-built, Spitz-type dog with a triangular shaped head, prick ears, and a harsh, straight coat of medium length. The body is either square or slightly longer than tall. The tail is thick and may be loosely rolled over the back or carried over the back in a sickle position. Gender differences in this breed are very apparent. Typically, males are larger with heavier heads while females have more fox-like heads. The appearance of the Jindo gives the impression of intelligence, strength, and agility. The breed is presented in a completely natural condition. Honorable scars or other evidences of injury resulting from hunting are not to be penalized. The Jindo is an enthusiastic hunter, able to follow cold trails of rabbit, raccoon, and badger. In packs, Jindo can hunt even wild boars and roe deer. Jindos are renowned for their loyalty to family members and their attachment to their home. Jindos have often been known to travel long distances to return to their original owner. The Jindo has a fastidious nature and puppies are housebroken with little training. Jindos also keep their coats extremely clean. Jindos are, by nature, watchful of other dogs and may, on their own territory, react aggressively to intruding dogs. Jindos are highly intelligent but because of their independent nature, respond best to positive reinforcement training, and preferably from their owner. While the Jindo is devoted to its owner, they are aloof and suspicious toward strangers. When viewed from above, the head is shaped like a blunt triangle. It should never appear clumsy or coarse. The skull is moderately broad between the ears, tapering in width towards the eyes. It is slightly domed when viewed in profile. There is a slight median furrow. The stop is well defined but not abrupt. The cheeks are well developed, dry and moderately round. Faults: Skull too flat; skull too narrow; short hair on the cheeks. Viewed from the side, the muzzle is shorter than the skull. The topline of the muzzle is straight and roughly parallel to the top of the skull. Viewed from the front, the muzzle looks more round than angular and tapers smoothly to a point from the stop to the nose. Lips are black and tight. Faults: Muzzle too long or too angular. Disqualifications: Overshot or undershot. More than three missing teeth. Nose color is black except that a pink nose is acceptable on a white dog. Nostrils are large and open. Disqualifications: Complete lack of pigmentation. Shape of the eyes is very important to establish correct Jindo expression. The eyes are small, almond-shaped, and set obliquely. Eye color may range from dark reddish brown to dark brown. Expression is intelligent and keen. Eye rims are tight and solidly colored black. Ears are strongly erect, small, triangular in shape, and set at the outer edge of the skull, but not too low. The ears are slightly rounded at the tips. Viewed from the side, the back line of the ear inclines slightly forward from the base to the tip in line with the back of the neck. Fine hair inside the ears is preferred. Faults: Lack of hair inside the ears; long, narrow ears; big ears. Ears that are not erect. The neck is thick, well muscled and strong, with no dewlap. When the dog is excited, the neck is carried proudly and well arched. The shoulders are strong, powerful and well laid back. Straight and parallel when viewed from the front, with the elbows held close to the body. The pasterns are slightly sloping. The squarely built Jindo has a chest that is moderately deep but not too broad. At its deepest point the chest reaches to, or just above, the elbow. The brisket is well developed and the ribs are well sprung. The back is strong and straight and the loin is well muscled, taut, lean and narrower than the ribcage. There is considerable tuck up. The thighs are well developed and muscular. Viewed from the side, the hind legs are moderately angulated at the stifle and hock. The rear pasterns are short. Viewed from the rear, the hind legs stand straight, parallel and not too wide or too close together. Dewclaws on the rear legs should be removed. The feet are of medium size, round in shape, with thick, strong pads. Nails are hard, and black color is preferred. The tail is thick and strong and set on at the end of the topline. The tail should be at least long enough to reach to the hock joint. The tail may be loosely rolled over the back with the tip touching the back or flank, or carried over the back in a sickle position. The tail is profusely feathered. Serious Faults: Tail too short. A dropped tail that is not carried over the back. The Jindo has a double coat of medium length. The outer coat is harsh, straight, and stands somewhat away from the body, particularly in the neck and shoulder area. The undercoat is soft, very dense, and shorter than the outer coat. The outer coat is short on the head, legs and ears, longer on the neck, withers back and rump, and longest on the tail and back of the thighs. Serious Faults: Short outer coat; soft outer coat; absence of undercoat. Excessively long coat. 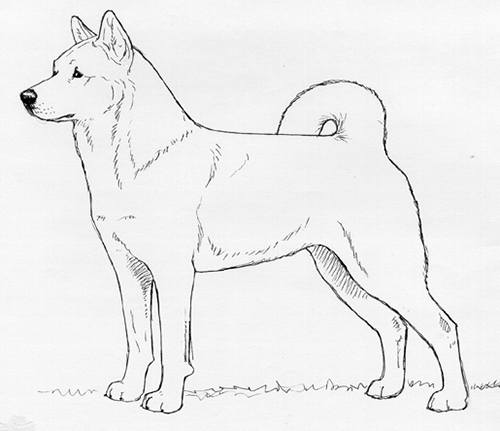 The Jindo comes in red fawn, white, black, black and tan, wolf grey and brindle. The undercoat is light in color. Desirable height at maturity, measured at the withers, ranges from 19½ to 21½ inches for males, and 17½ to 19½ inches for females. Weight should be in proportion to the height, giving a well muscled, lean appearance without being too light or too heavy. The average weight for a male Jindo in good condition is 40 to 50 pounds; for a female, 33 to 42 pounds. Eliminating Fault: Over or under the heights specified in the standard. The gait is powerful and steady, with the dog carrying a firm, level back. The dog trots with its head held high, but as speed increases the head is carried lower, almost at the level of the shoulders. Faults: Choppy or stilted gait. Over or under the heights specified in the standard. More than three missing teeth.